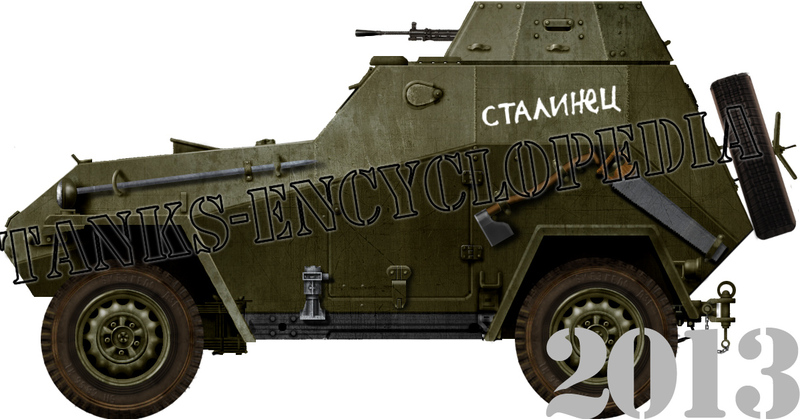 The BA-64, the standard light armored car of the Red Army, was first envisioned between July and December 1941 on the chassis of the GAZ-64 car. 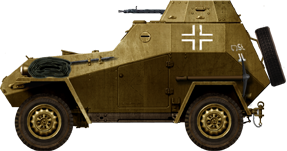 It used both pre-war Soviet developments in all-wheel drive armored cars and the experience gained in the study of captured German armored vehicles, like the Sd.Kfz.222. 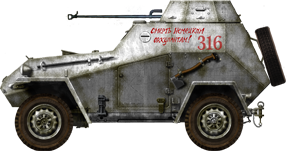 The BA-64 was the first Soviet all-wheel drive armored car and would remain the only vehicle of this class in service during the war, with a production of up to 9110 armored vehicles from April 1942 to early 1946. 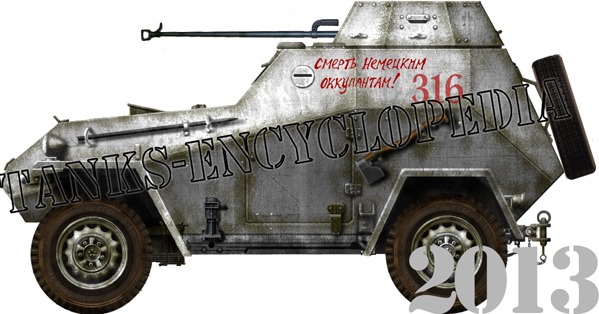 Before the summer of 1941, the only light armored car in service with the Red Army was the BA-20M, based on the GAZ-M-1. 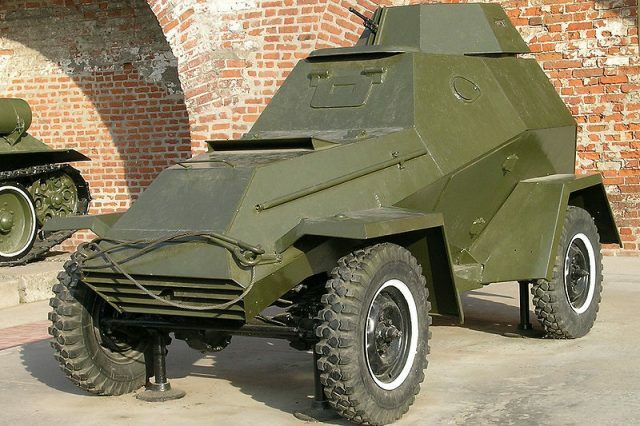 It had a rear-wheel drive chassis, unable to provide off-road capabilities and having weak armor, barely capable of resisting machine-gun fire. 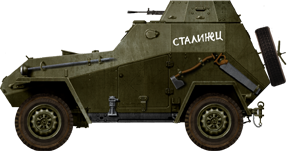 However, the personal vehicle GAZ-64 was just entering service in 1941 and used all-wheel drive, well adapted for bad terrain. 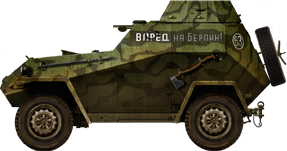 It was decided to replace the BA-20 with a new armored vehicle based on the GAZ-64 using sloped armor, already tested for small vehicles. On July 17, 1941, the GAZ Design Bureau, under the direction of A. Grachev, began work on the future BA-64. At first it was planned to use the maximum amount of parts from the BA-20, but it quickly appeared that the new hull required new solutions. Before the war started, Sd.Kfz.221s and 222s were tested at the German-Soviet testing ground, the landfills at the Institute of Kuban. Russian engineers were already familiar with their hull shapes. One was transferred to GAZ for a detailed study. A meeting was held at GAZ in September 1940 to discuss the new model, then called 64-B, and chief designer A. Liphart defined a minimalist vehicle with a sloped hull only slightly protruding the frame chassis. All internal components had to be redrawn to fit inside the cramped, sloped hull and all measures of ultra-rationalization of the internal space applied. The tasks to be undertaken by the new armored car included those of the BA-20. These were chiefly reconnaissance, communication and dispatching, officers transport on the frontline, skirmishing with enemy vanguard units, pursuing and harassing retreating or routed enemies, close support for the infantry, AA defense, cavalry operations, coordination and possibly airborne operations, due to its feather weight. 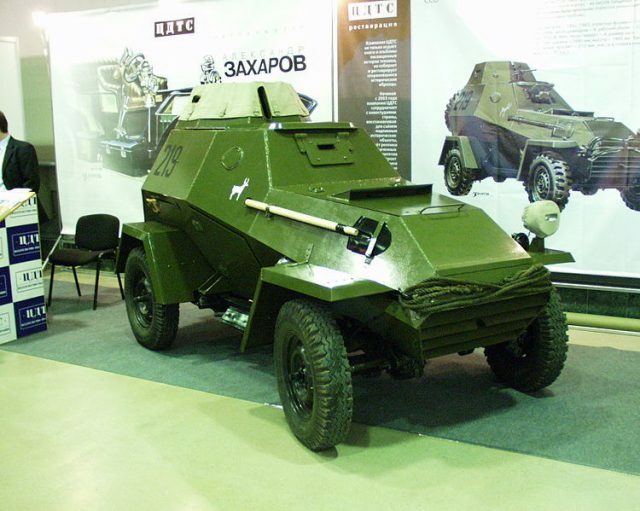 Development at GAZ-125 was performed by armored body specialists – BT Komarevsky, VF Samoilov, N. Sorochkin, G. Nosov, as well as the designer of OKB AS, who dealt with the design of the turret and NA Astrov as consultant in exercise works. By 15 October, the first and second options for the internal layout were ready, after which the team started to work under the direction of chief designer GM Wasserman. Despite the lack of experience of most designers, it progressed rapidly. By November 24-27, the body armor was ready, demonstrated before Marshal Voroshilov, who supervised the project. Final prototype’s “64-125” assembly was finished on January 9, 1942, and made its first trip, showing excellent characteristics, save for a weakness of the suspensions. By February 17, the BA-64 was shown to the Commissar for Tank Industry VA Malyshev in Moscow. Then it was finally approved as BA-64 and, between February 21-23, weapon tests were conducted at the Sofrinsky artillery range and the range of Plant Number 8. On March 3, along with the new light tank T-70, it was again demonstrated at the Kremlin before members of the government, including Stalin himself. After all the necessary improvements, the BA-64 was accepted for service on the 14th of March. Grachev was awarded the Stalin Prize of the third degree in April, for the development of the GAZ-64 and the BA-64 on its basis. The body was assembled by welding sheets of rolled steel armor ranging from 4 to 12 mm (0.16-0.47 in) (early) or to 15 mm (0.59 in) (late). The hull had a hexagonal cross-section, all surfaces being placed at an angle of at least 30°. The frontal part was 12-15 mm (0.47-0.59 in) thick at 40°, the two lower front plates were 9 mm (0.35 in) at 30° and 52° angles. On later production models the two lower sheets has been replaced by a single, obliquely arranged at 32°. 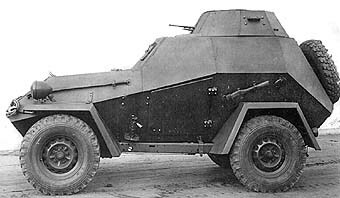 The bottom front of the chassis was used as air intake for the engine, and had 6 mm (0.24 in) armored shutters. The lower part of the body was made of boards placed at an angle of 30°, 9 mm (0.35 in) thick. The upper side plates were at 30°, 6 mm (0.24 in) thick for the engine compartment and 9 mm (0.35 in) for the driver’s and crew compartment. The floor and roof were 4 and 6 mm (0.16-0.24 in) thick. The level of protection was ideal against small arms fire from any distance. 12.7 mm (0.5 in) conventional bullets were deviated on the upper frontal sheet at all distances, while the rest of the armor was efficient only at distances of more than 500 m (547 yd). Armor-piercing 12.7 mm (0.5 in) bullets were only stopped by the upper frontal plate at distances of more than 800 m (875 yd). Access for the crew was ensured by two hatches in the lower part of the fighting compartment and the commander had his own access point on top of the turret. The turret was an octagonal truncated pyramid, open-topped with 30° sloped armor, 9 mm and later 10 mm thick (0.35-0.39 in). It was placed on a rotating column resting on the floor of the crew compartment, and later the stability of the turret was improved by four rollers on the roof. Rotation was carried out manually and could be locked in position with a handbrake-clamp. The top could be covered with a folding metal grid, later eliminated, and a canvas was added for weather protection. Its height was increased from 275 to 290 mm (10.82-11.41 in) during production. 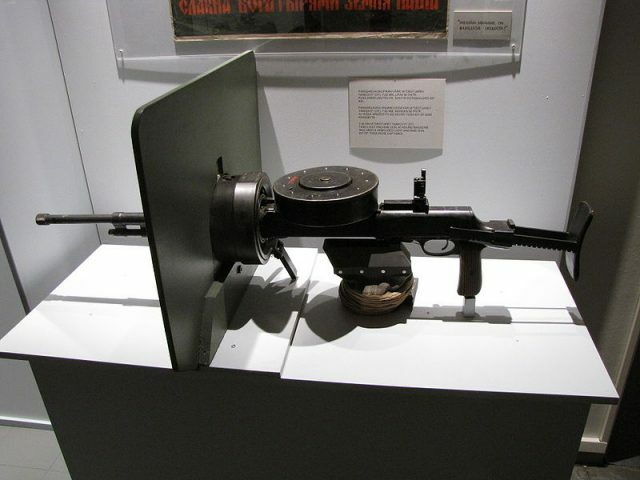 The DT-29 was a 7.62 mm (0.3 in) machine gun with an initial velocity of 840 m/s (919 yd/s) and a rate of fire of 600 rounds per minute, with practical rate up to 100 rounds per minute. It weighed 8.35 kg and was placed in a vertical porthole, which allowed for -36° to +54° elevation. For firing at air targets a flywheel was added to climb over the top edge of the turret, allowing it to rotate freely. It could also be removed for use outside the car and was supplied with a detachable bipod. A standard diopter sight allowed it to deliver aimed fire at a fixed distance of 400 m, 600 m, 800 m or 1000 m (437, 656, 874 and 1093 yd). The maximum sighting range was 1500 meters (1640 yd) when firing at air targets by using the ring sight, but maximum reach was 500 meters (546 yd). 1260 rounds were stored in 20 disk stores, but the radio versions had only 17 magazines and 1,071 cartridges. In addition, for close defense, six F-1 fragmentation grenades were stored as well as PPSH sub-machine guns. The driver had a manhole periscope mirror with triplex glass cover and inner armor valve, similar to that of the T-60 model, providing an overview of the frontal area. On the BA-64B, two upper side armor flaps were fitted. 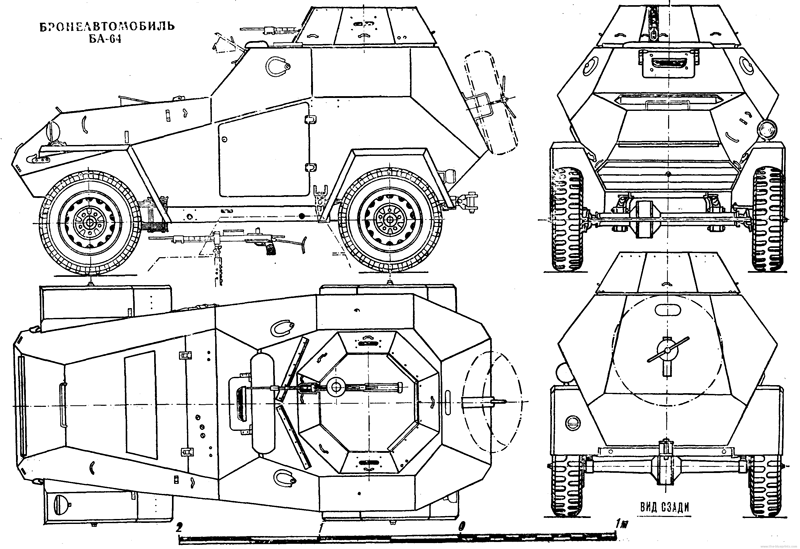 The commander could monitor the battlefield through the turret’s open top or from the machine gun embrasure. The side plates housed the two extra vision slits with armored flaps and protective triplex glass visors. Later they were replaced by a mirror periscope similar to the driver’s. The majority of the BA-64 issued had no external communication means and only a few were fitted with radio stations of different models. These were the RB-64-142200 or 12RP on the BA-64B, and the 12RPB with different antennae and a headset instead of a handset, which increased effectiveness. Communication range was 8-15 km (5-9.3 mi), depending on the terrain, or 30 km (18.6 mi) by telegraph, but in motion the active range was reduced to 4 km (2.5 mi) and only possible for the 12RPB. The BA-64 engine was borrowed from the GAZ-64, the GAZ MM, an in-line 4-cylinder, four-stroke carbureted engine with liquid cooling. With a working volume of 3280 cm³, the engine had an output of 50 hp at 2800 rpm. There were different changes in the design of the engine system compared to the one on the GAZ-64, that enabled it to work with low-grade gasoline and oil. The fuel tank of the BA-64 accommodated 90 liters of fuel. The BA-64B required the installation of another 54 liter fuel tank and a modified engine and carburetor design. The transmission of the BA-64 included a single-plate dry clutch friction, mechanical five speed (4+1) gearbox, a manual single-stage transfer case, allowing to disable the front axle, and two propeller shafts connecting the transfer case with the two bridges. By February 1943, a shift lock mechanism that prevented simultaneous inclusion of the first gear and reverse was introduced. 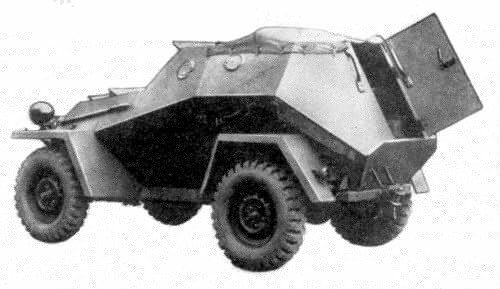 The BA-64 chassis had 4×4 drive. The front suspension consisted of two leaf springs and hydraulic shock absorbers. The rear wheels were equipped with semi-elliptical leaf springs, two hydraulic shock absorbers and a torsion stabilizer for lateral stability. 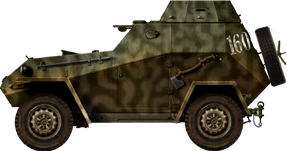 After February 1943, two additional shock absorbers were added on the front wheels, as well as reinforced springs. The BA-64B differed by being wider, which increased the stability of the machine and allowed the lateral stabilizer to be abandoned. In addition, in October-November 1944, the chassis was further strengthened. The steering system consisted of a globoid worm drive and double roller with longitudinal and transverse rods. There were drum brakes on all four wheels, with a mechanical drive. 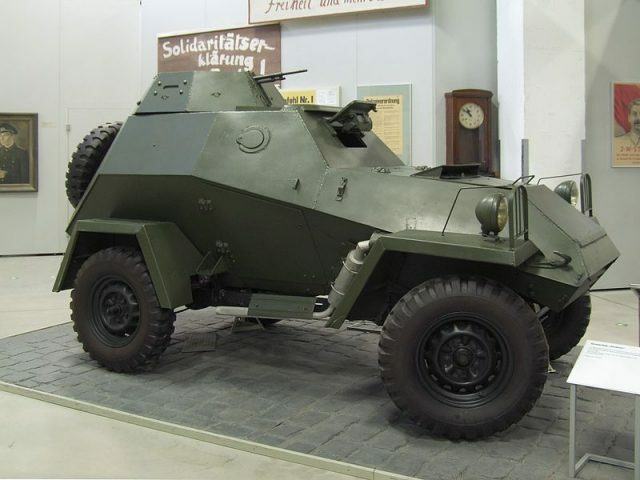 The wheels could be equipped in combat with bullet-proof tires size 7.00-16 type SC filled with foam rubber However, they limited the top speed to a mere 40 km/h (24.85 mph), so in non-combat situations conventional pneumatic tires were used instead. Production of the BA-64 fully commenced at the GAZ factory plant in April 1942, and a first batch of 35 was delivered the same month, but not accepted by the military because of the lack of bullet-proof tires. They were taken in service anyway in early May with standard tires. Delays occurred in the supply of components, especially engines, axles and tires, but in July 1942 the plant had reached its objectives. First changes came with the first operational experiences. Already in June, the folding grids over the turret were eliminated. In July, a vent in the roof of the driver’s compartment was introduced, as during summer the temperature in the crew compartment could reach up to 55-60°C. In September, an adjustable ventilation hatch in the roof of the engine compartment was added, as its ventilation was shown to be insufficient. Operations also identified a general lack of reliability. Despite a guaranteed mileage of 10,000 km (6213 mi), according to reports, many BA-64s broke down already at 1000-4000 km (621-2485 mi). The main reason was rear axle failure. This was caused by overloading that occurred in the majority of cases as a result of improper handling and increasing torque abnormally to the rear axle. By November, a non-disconnectable front axle was introduced and the conversion of many BA-64s was carried out by local military workshops. By February, the revised design introduced a number of changes aimed at strengthening the semi-axles and bridges, and later an additional pair of hydraulic shock absorbers and reinforced springs. Peripheral vision was also enhanced. In June 1943, GAZ suffered massive German air raids, temporarily paralyzing all work in the plant. 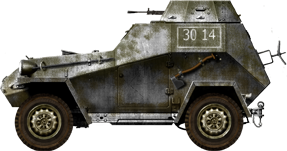 However, from April 1942 to June 1943, GAZ had already delivered 3901 BA-64 (of the early type), including 1352 radio versions. Production was resumed with the BA-64B in September 1943, and continued until 1946, reaching a staggering total of 9110. The BA-64 showed a lack of lateral stability due to its narrowness and a relatively high center of gravity imposed by the sloped hull. However, the solution of a broader track was postponed to avoid production disruption. On August 31, 1942 however, at the initiative of the Design Bureau, the broad track model was studied again and in September a plan of radical modernization was transferred to the GABTU for approval. The first prototype of the upgraded BA-64, (factory designation 64-125-B), was ready by the end of October 1942 and went in for trials. 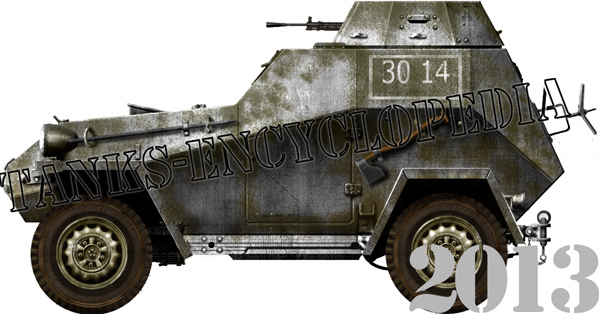 Production of this upgraded version, larger and up-armored (15 mm/0.59 in) was launched in 1943 and lasted until 1946. These late vehicles were made using parts made in the Czech Republic and Poland, final assembly still being performed at GAZ. Many were transferred to East Germany, as police armored vehicles. Other were supplied to North Korea, China and Yugoslavia. Some BA-64Bs received a SG-43 machine-gun experimentally in March 1944, this new weapon surpassing DT-29 in range and impact. However, the tests revealed many fixation and reloading problems, ceasing all further testing. The BA-64D was a series of prototypes fitted with a large-caliber 12.7-mm (0.5 in) DShK. 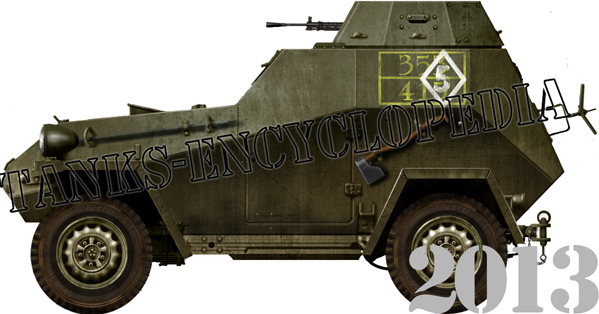 This machine-gun gave the opportunity to fight other lightly armored vehicles and its much higher rate of fire also dramatically augmented its AA effectiveness. The first was ready in September 1942, the tests showing that a new and much stronger turret was needed and the need to adapt K-8T scopes for anti-aircraft fire. On March 20, 1943, the improved prototype was ready. The much larger turret had 12 mm (0.47 in) thick armor plates and was mounted on ball bearings on the roof of the crew compartment, expanded and strengthened and rotated horizontally with a screw mechanism. It came with a drum magazine with 30 rounds of ammunition. However, tests showed that it could not cope with the powerful recoil and hull stress during firing, resulting in lowered accuracy. Also noted was the poorly designed magazine, which was solved with the next version. An upgrade to a 25 mm (0.87 in) autocannon was envisioned, but the whole development was halted. Another batch of vehicles tested the 14.5 mm (0.57 in) PTRD-41 anti-tank rifle. 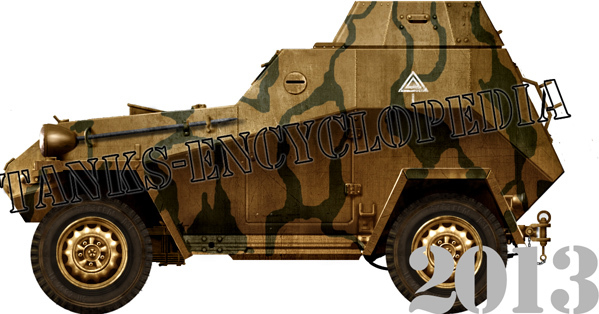 Its armor piercing bullets gave the opportunity to fight against light and even medium armored vehicles at short range. Development was launched in November 1942, but was later postponed due to the higher priority of the BA-64D. It was discontinued, and meanwhile a self installation kit of a lighter PTW-41 instead of the machine gun was also tested for conversions in the field. An experimental railway modification of the BA-64 was developed in the summer of 1942, at the Vyksa plant. By early 1943, three more prototypes were assembled at GAZ. 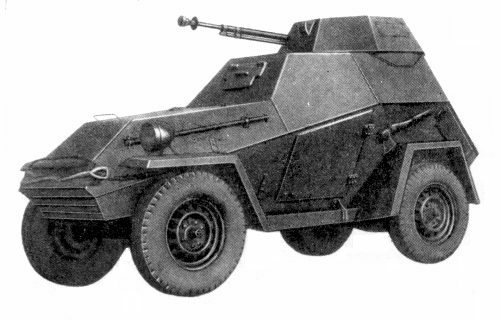 These version differed only in the presence of removable rail wheels taken from the remainder of the production of the BA-20zhd armored car. The tests showed a rapid deterioration of the hull caused by vibrations, as well as the lack of reverse speed, causing this version not to be adopted. The BA-64G was the second pilot train modification of the BA-64, carried out by KB GAZ between July and September 1942. Both prototypes were based, in turn, on an experimental prototype of a broad BA-64-125B. Their chassis differed by having two lifts with rail wheels of small diameter or the contact with the railroad performed by rubber tire wheels. In addition they could reverse at full speed, as well as having railway signaling. However, by the summer of 1943, this concept was considered unnecessary. These armored personnel carrier prototype series (referred to as “amphibious armored vehicle”) were developed at GAZ in September 1942, caused by a lack in the Soviet Army of such vehicles. Although at the outset it was clear that the BA-64, with its narrow and cramped housing, was not well suited, it was also the only wheeled armored vehicle mass-produced at the time. Tests, as expected, showed it was too cramped and failed to provide rapid entry and exit for the troopers. In April, a second prototype was built, this time on the broad-track BA-64B chassis, removing the armament to make more room. 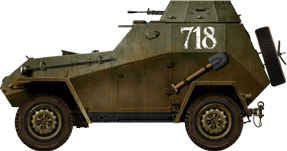 The development had a low priority by the end of 1943 and ultimately three prototypes were built, designed for combat tests which lasted until March 1944. According to various estimates, between eight and eleven BA-64Es were built in all until September 1945, but the model was never accepted in service. 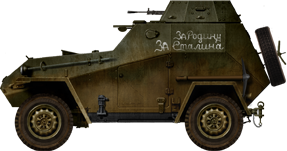 The BA-64 was widely used by Soviet troops from the summer of 1942 until the end of the war, mainly as a reconnaissance vehicle and also in direct support of the infantry. 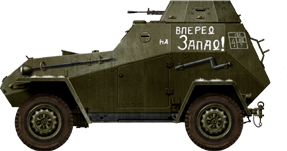 In the postwar years, the BA-64 was mainly used as a training and combat vehicle and withdrawn from active service during the first half of 1950. The BA-64 was also delivered in numbers to Soviet Union allies and used in the Korean War. Its deficiencies were clearly shown. Early unreliability, poor horizontal stability, lack of firepower, cramped and hot interior. 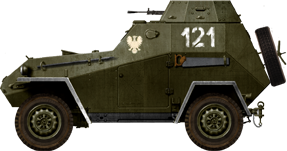 Despite of this, it remained popular due to its speed and the relatively good protection of nearly 15 mm (0.59 in) of sloped armor, giving an equivalent of 20-22 mm (0.79-0.87 in). A Model 1942 BA-64, summer 1943. Early production BA-64, winter 1943-44. A Model 1942 with the first field upgrade, additional driver side sights. A Model 1942 late production vehicle on the Southern Front, with an unusual camouflage, summer 1944. BA-64B, the broad track version, up-armored. Another BA-64B, unknown unit, Northern Front, 1944. A BA-64B on the Southern Front sector, early 1944. Another rare livery applied in the field. A Polish BA-64 (model 1943) in 1945. One of the few BA-64AT (unknown insignia), armed with the PTRS-41 14.5 mm (0.57 in) antitank rifle, here tested in combat, unknown unit, winter 1943-44. Captured BA-64, SS Panzer Grenadier Division “Das Reich”, Kursk, July 1943. SS Pzd “Totenkopf” also operated captured vehicles, usually reequipped with a MG 34 or MG 42 machine gun. The first version BA-64, or model 1942. 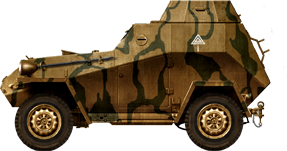 A BA-64E, the APC version. Most prototypes were based on the broad track BA-64B. They were tested in combat but never accepted for production. A BA-64D, up-gunned version with a heavy DSHK 12.7 mm (0.5 in) machine gun. Several prototypes were built and tested, but never accepted in service. The original hull was just too weak for the vibrations and recoil of the gun, plus it had to be fitted with a new turret and specially redesigned magazines, which rendered reloading difficult. A BA-64B preserved at Nizhniy Novgorod Kremlin, Russia.